Our Curcumin is grown in India and further processed by Sabinsa Corporation in the USA. Curcumin is a bright yellow chemical produced by some plants. It is the principal curcuminoid of turmeric (Curcuma longa), a member of the ginger family. It is sold as an herbal supplement, cosmetics ingredient, food flavoring and food coloring product. Curcumin has anti-oxidant, anti-inflammatory effects, supports immune health and is currently investigated as an anti-cancer treatment. Indian turmeric is considered the best in the world market because of its high Curcumin content. Turmeric can be grown in diverse tropical conditions from sea level to 1500m above sea level, at a temperature range of 20-35 oC with an annual rainfall of 1500 mm or more, under rain-fed or irrigated conditions. Though it can be grown on different types of soils, it thrives best in well-drained sandy or clay loam soils with a pH range of 4.5-7.5 with good organic status. Depending upon the variety, the crop becomes ready for harvest in 7-9 months after planting during January-March. The land is ploughed and the rhizomes are gathered by hand picking or the clumps are carefully lifted with a spade. The harvested rhizomes are cleared of mud and other extraneous matter adhering to them. 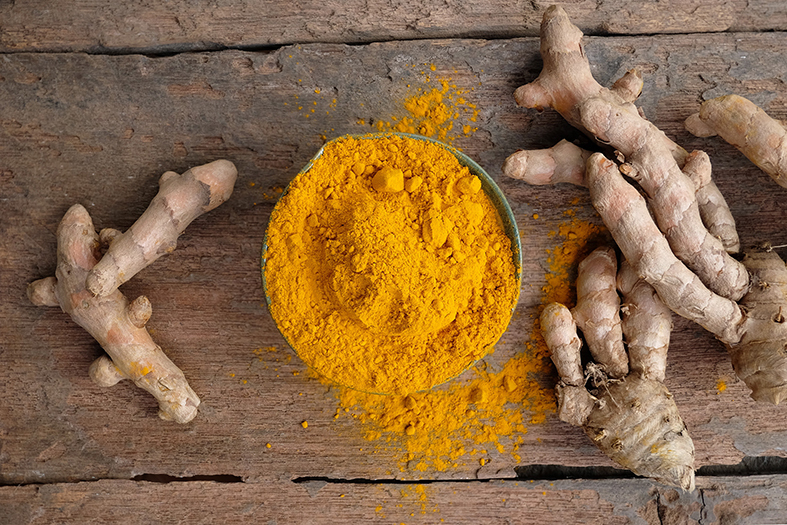 Curcumin can be found in our product Gut Feeling.